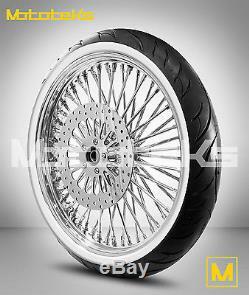 21X3.5 FAT SPOKE WHEEL FOR ALL SOFTAIL MODELS W/ ROTOR & TIRE. 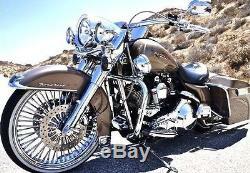 FITS 1984-PRESENT SOFTAIL MODELS (PLEASE SPECIFY YEAR & MODEL WHEN PURCHASING). PLEASE NOTE: ABS BEARINGS ARE ADDITIONAL & THEY ARE NOT INCLUDED. TIRE FITMENT : SHINKO WHITE WALL 120/70-21. HIGH POLISHED STAINLESS STEEL ROTOR W/ HARDWARE. RUST RESISTANT STAINLESS STEEL SPOKES. TRIPLE CHR OME BILLET ALUMINUM HUB. WHEEL IS SEALED FOR A TUBELESS APPLICATION. OTHER AVAILABLE SIZES: 26X3.5, 23X3.5, 21X3.5, 21X2.15, 18X3.5, 18X4.25, 18X5.5, 16X3.5, 16X5.5. The item "FAT SPOKE WHEEL 21X3.5 FOR HARLEY SOFTAIL MODEL ROTOR WHITE WALL TIRE MOUNTED" is in sale since Saturday, April 28, 2018.